Nick Clark comes to us from Great Britain, but has made a nice home for himself and his wife and two children in Fort Collins, Colorado. He took the time to speak to Inside Trail about a few things. 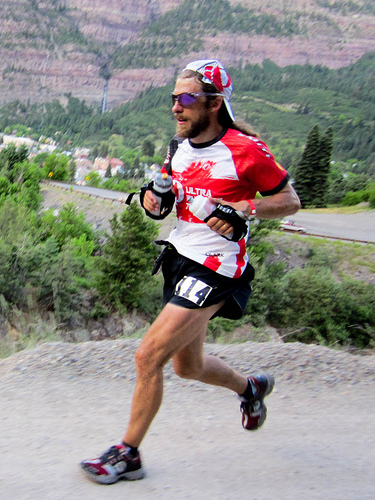 As a brief background for those somehow unaware of this mountain runner’s recent accomplishments, in 2011 alone he has two podium finishes at two huge American 100 milers, Western States and Hardrock. He broke Kyle Skaggs’ course record at Jemez 50. Safe to say he’s done a lot of trail damage this year. He had an exceptional 2010, as well. 2009? Go look them up (http://irunmountains.blogspot.com/). Get to know him. This long distance deviant is getting better with age. As you read, he’s either running Sierre-Zinal or has just finished, and is licking his chops for the UTMB. Inside Trail: Alright, let’s start with a question about what I’ll call “the leap.” For the record, please give us a sense of what went into your transformation from a rock solid British/local Fort Collins trailer to a world-class mountain runner. Did it mean taking a kind of leap of faith on your part that you could compete at that level? Was it more the training and experience? Nick Clark: Well, as a point of clarification, I would first emphasize that I am far from a world class mountain runner – that will be brought into sharp focus at Sierre-Zinal this weekend. However, it would be fair to say that I have had some good success at the ultra distance mountain races this year and last. I don’t really consider myself to be that great of a runner – far from it in fact – but with that said I have been able to show resilience over longer distances and hilly terrain against runners who I would typically consider to be more talented than me. For the most part, I attribute this to the specificity of my training. I train very specifically for races in the mountains that last for a very long time. When I beat guys who are genuinely faster than me, I would bet most of that is because they are not properly trained for the discipline. Whether or not the sub 2:20 marathoner beats me at, say, Hardrock with more specific training, I don’t know, but I would definitely say that raw speed is much less a factor in an event like Hardorck than, say, the North Face 50 in San Fran. Beside specificity, there are probably some good endurance genes in my system too. My cousin competed at a very high level in Nordic Skiing, just missing out on the US Lillehammer Olympic team by one qualifying place, and another cousin is currently pursuing her Olympic dream (for the UK team). Both cousins are the offspring of an equally talented uncle, so maybe there is some kind of endurance gene that has come down through the paternal line? Good genes or not, the potential doesn’t get tapped without putting in the work. I have ideal training grounds out my front door that offer 50 miles of very hilly trail between the elevations of 5,500′ and 7,500′. I take full advantage of that terrain and train hard. This year’s success came from last year’s consistency in training, which in turn built on consistency from 2009. Being injury free and training hard in this sport is a huge contributing factor to success, in my opinion. Furthermore, I recognize that the sport of mountain ultrarunning is a small world (even globally), so with an element of talent and good old fashioned hard work, success is not nearly as hard to come by as it is in other much more competitive sporting arenas. Finally, I am a firm believer in setting aggressive goals. The more aggressive your goals, the harder you’ll push yourself to achieve them. IT: You currently seem to be working with some really nice sponsors, especially The Pearl Izumi Ultra Running Team (I saw a killer PI ad in a magazine recently, which was all you!). Can you talk briefly about how some of those relationships have contributed to your training and racing? NC: The relationship with Pearl has really blossomed this year and last, and on a progressive basis ever since Scott Jaime, Aric Manning, Josh Brimhall and Bob Africa got the ball rolling five or six years ago. Obviously costs are cut significantly when you have sponsors that essentially cover any item of gear you might conceivably need. Between Pearl, First Endurance, Nathan and Smith those bases are covered 100%. Pearl has also stepped up this year – as our primary sponsor – in getting us to races and with other logistical costs. IT: Hardrock 100. Congratulations on a great race (3rd). Your typically great prose captures that insanity too well. Will you ever run that race again? Why (in the world would you do that) or why not? NC: Hardrock will be my major focus in terms of racing next year (if I can get in). Most everyone who runs the darn thing seems to get hooked on it. I am no exception. As an ultra-distance mountain specialist based in the U.S., there really is no other race that offers a better test. I’d really, really like to run the course in the same direction as Kyle (which will be the case in 2012) to see if I can get close to his landmark record. IT: What are your expectations going into Sierre-Zinal? Is this part of a taper for the big showdown Aug. 26? Are you racing for keeps? Other than Scott Jamie, who will you have your eye on as you engage the Five 4000m Peaks? NC: I hate to sandbag, but expectations are low for S-Z. Firstly, the race is a performance-based, shorter mountain race and I simply haven’t been training to develop the kind of power output that will be required to be competitive there. Even if I had, I just don’t have the talent to compete with the best in the world in this type of event. I’ve been feeling my legs come around a bit in the last few days, so I’m hopeful that it won’t be a total horror show, but in all honesty it has been relegated in my mind to a last hard effort for UTMB. This is a shame as the event deserves to be treated as a goal race. All that said, I’ll be there pushing out the same full-on effort that I always do when racing. I don’t do the ‘race as a training run’ thing. Contenders in the men’s race will include Kilian Jornet, Robert Krupikca, Marco di Gasperi, Max King, Glenn Randall, Joe Gray and a whole host of other talented guys that I’ve probably never heard of. On the women’s side, the US will be represented by three very strong Colorado-based runners: Megan Lund (winner last year), Brandy Erholtz (third last year) and Megan Kimmel (who appears to be in very good form this year). IT: Similarly, what are your thoughts about the UTMB? Who do you see battling it out for the win there, other than yourself? NC: My predictions for the podium go like this: Jornet (CR), Heras, Wolfeman [Mike Wolfe]. Others in contention will include Jez Bragg, Dakota Jones, Sebastien Chagineau, Joe Grant, Scott Jurek, and a couple of other Europeans whose names escape me right now. I’ve probably forgotten some of the US contenders too. For the women, I like Darcy for the win, and then Krissy and Lizzy Hawker to round out the podium. IT: Do you have any thoughts on the American ultra/mountain running sport vs. the European version? What do you see transpiring over the next 5 years in terms of this sport becoming truly international? NC: Well, we (in the US) have pretty much been schooled by the Europeans in the last eight or nine months. We’ll see what transpires at UTMB, but I fully expect a Spaniard to be crossing the finish line first. With that said, I think the US boys will show well in the overall top 20. I am yet to run an ultra in Europe, so can’t really comment on US vs. Euro courses. The mountain running scene is definitely bigger in Europe, so I am really excited to get a taste of that. It’s growing in the US, and good things are happening, but it just doesn’t have the history of European mountain running. It’s not good for TV! In terms of the next five years for the sport of ultrarunning, I think it is an exciting time. A lot of shoe and apparel companies seem to see value in ultrarunning from a marketing standpoint (despite the small size of the actual market), so they are pumping money into the sport. A lot of that seems to be directed toward promoting athletes, which I think means that there will be a number of high profile races around the world with increasingly competitive fields. Salomon and NF appear to be leading the charge on that front, but companies like Montrail, NB and Pearl are also interested in seeing their athletes competing at the big races for visibility purposes. For me, the humble runner dude, this is obviously a good thing. I love traveling, but with two kids, a wife and a mortgage, major international travel has essentially been out of the question over the last five years. IT: Lastly, how on earth will you top this year? A friend of mine said he asked you that same question about your ’10 season, but this year has been truly epic for Nick Clark. Can you provide any clues? NC: Avoid injury and continue to train hard. There are no secrets in the sport of running. IT: Nick, thanks so much! All the best to you in Europe and beyond. Sierre-Zinal . . .The perfect mountain running race? I sort of wish I could bring myself to dislike this guy. But he is too damn nice, hard working, humble and aggressive. 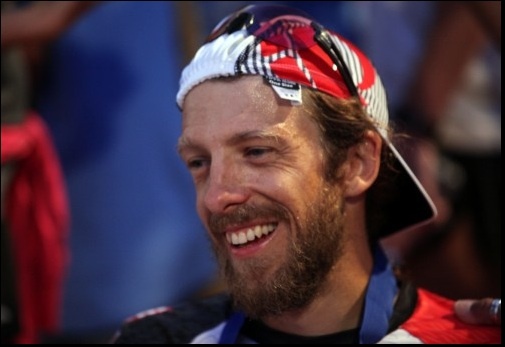 It’s strange that he did not mention “Geoff Roes” for the UTMB. We thought the same thing. It was maybe just a mistake on Nick’s part. Interesting and observant on your part. Yup – oversight on my part. Geoff is of course a major contender at UTMB.